Art Quilt Australia 2015 Exhibition : 23 October- 13 December | Canberra Quilters Inc.
Official Opening 6pm-8pm Friday, 23 October: Limited spaces. Please RSVP directly to the National Wool Museum – nwminfo@geelongcity.vic.gov.au (Tel 03 5272 4701). Ozquilt Network Inc, through its Art Quilt Australia exhibitions, seeks to promote the best of Australian art quilts and has joined with the National Wool Museum to present Art Quilt Australia 15. 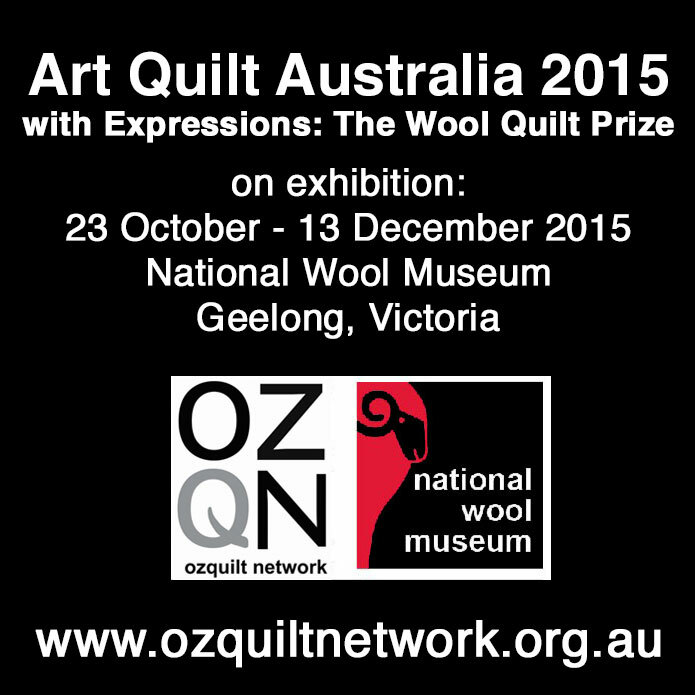 The exhibition will be held at the National Wool Museum, Geelong from Saturday 24 October 2015 to Sunday 13 December 2015. This is a juried exhibition with over $6000 in prizes, including a $3000 Expressions Wool Quilt Award. The winner of the Expressions prize is acquired by the National Wool Museum for its permanent collection. Quilt in banner is ‘Leaf Bed’ by Beth and Trevor Reid, exhibited at the 2015 CQ Members’ Exhibition.